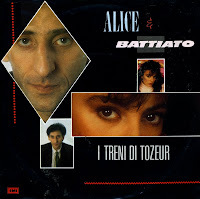 Italian singers Alice Visconti and Franco Battiato represented Italy during the 1984 Eurovision song Contest with 'I treni di Tozeur'. It earned them a fifth place in the Contest and one of the biggest hits of a non-winning Eurovision entry - at least in the Netherlands, peaking at number 17 in the Dutch Top 40. I don't usually do this, but the Wikipedia entry on this song is so extensive, that you really should read it. It gives more information about the lyric and the composition than this short description here could ever give you. What remains here, is the song - and it really is a beauty.